By accessing this site or downloading materials from these Websites, you agree to the following terms. Please note that you may not use the Site if you do not accept these terms. The content of this Site is copyrighted touFlowerdesign.gr, without prejudice to any rights not expressly granted herein are reserved. All intellectual property rights in this Site containing stoFlowerdesign.gri belong to third parties rightfully concerned. By accessing this Site you agree to accept the above copyright laws. Personal precisely DedomenaToFlowerdesign.grefarmozontas the principles of protection of personal data, provided by the International and European law that regulates issues relating to electronic commerce (Directive 2000/31 / EC, Decree 131/2003) and also by the Law on the protection of consumers (N. 2251/1994) which regulates matters concerning remote sales and the relevant provisions of Greek law (Law. 2472/1997) to protect the individual and the protection of personal data as supplemented by the decisions of the President the Privacy Commission, PD 207/1998, 79/2000, Article 8 of Law. 2819/2000 and European law with the directives 95/46 / EC and 97/66 / EC, explicitly states that it will not make any unauthorized use of your personal data and in no way disclose, publish, sell, lease or exchange your personal information and the information you submit to any third party. Your personal information upon your request be deleted and not given to anyone in any way. By submitting material to our server, you agree that the material does not contain false, illegal or in any way unfit for use and publication. Third Party Websites MeronGia facilitate your access to websites, toFlowerdesign.grmporei include links to sites on the Internet, which are owned or managed by third parties who are responsible for their content. Limitation EfthynisToFlowerdesign.grechei make every effort to display as accurately as possible the products available to view pictures, descriptions and specific comments. However, this website may contain errors (typographical, numerical and visualization). ToFlowerdesign.grden guarantee the accuracy or completeness of the depictions and descriptions or reliability of any advice, opinion, statement or other information displayed or distributed through this Site. Modification of terms parontosToFlowerdesign.grdiatirei the right to modify or update the terms and conditions of transactions and undertakes to update this document for any change or addition to the terms. Property - Commercial SimataTo content of the website, the logotypoFlowerdesign.greinai property of Panagiotis Manavis. The product names and company names mentioned on this website may be trademarks or tradenames of their respective owners. Your access to this website should not be construed as granting, by implication, estoppel or otherwise any license or right to use any marks, logos, images, representations on this website, without our prior written consent or any third party owner them. Prices Proionton Oles prices shown in our catalogs include VAT. These values relate to amounts that are available in our warehouse, and toFlowerdesign.grepifylassetai the right to adjust prices. For some locations to which they apply reduced VAT rates and if your order is made by invoice then product prices are lower than those indicated by the reduced VAT. Present Dikaio Oles transactions made through touFlowerdesign.grdiepontai by the International and European law that regulates issues relating to electronic commerce (Directive 2000/31 / EC, DPR 131/2003) as well as the Consumer Protection Law (Law. 2251/1994) which regulates matters concerning remote sales. Immediately reserve the right to "deviate" in the choice of flowers or plants are a composition and color and type when these are not available on the market or when not in stock of our shop. In any case the type of course that will be delivered will be aesthetically and economically equal to the projected sample directory. So if you do not wish such changes (where they are necessary), please note the corresponding field observations the order form. Then if we can not execute on the exact projected in our sample catalog, we will inform you promptly and clearly we will refund your money. Otherwise you accept the "right of derogation"
Proof of delivery confirmation applies the signature of a person in the corresponding order form. But there are cases where it can be signed and third party deliveries to places as cemeteries, hotels, hospitals, companies, etc. where it is not possible to deliver the order to the same recipient. Complaints about the good quality of delivered products are ONLY accepted on the day of delivery and only by the sender (who has been charged and the value of these) and not subsequently in writing by fax or e-mail. In these cases immediately send our representative to the recipient of the order, we check the product and as long as you actually see a problem, we replace it with a new one. Order Cancellation accepted up to (one) day before the delivery date. In this case you just refunded the amount for which you were charged. Not accepted cancellations of orders submitted on the same day for execution on the same day. Even in the case where the sender "change his mind" and does not wish to send flowers, they can be sent but not costs of the original amount is not refundable. This is because once we receive an order we proceed immediately to the construction of the product by treating the flowers needed, which the possible cancellation of the order is impossible to return to their position in their original condition without receiving damage. 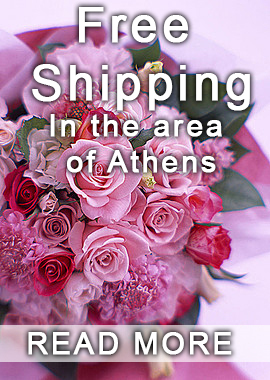 Not accepted cancellations or refunds relating to orders to destinations the Rest of Greece (outside Athens) and abroad and are sent for execution at a partner member of our network. But because the flowers are a peculiar species that almost always the one who buys it sends it to someone else who may either not to accept, or simply refuse to sign or to reserves and not to sign it received well etc. . in no case is the absence of the recipient's signature order form reason for refusing to charge ordering and questioning this. Complaints about the good quality of the products delivered are accepted ONLY on the day of delivery and ONLY by the sender (who has been charged and the value thereof) and not later, in writing by fax or e-mail. In these cases immediately send our representative to the recipient of the order, we check the product as long as you actually see a problem, we replace it with a new one. Immediately reserve the right to "deviate" in the choice of flowers or plants are a composition and color and type when these are not available on the market or when not in stock of our shop. In any case the type of course that will be delivered will be aesthetically and economically equal to the projected sample directory.